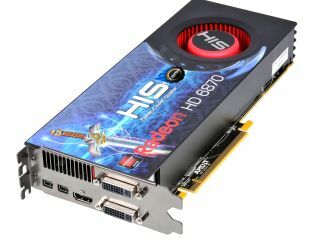 HIS has announced its latest 6870 Fan Turbo graphics card, a 1GB GDDR5 PCI-E option with HD3D support. The Hightech Information System HD6870 Fan Turbo has apparently been overclocked to 920MHz, which the company states will 'deliver fast in-game performance'. The latest card's support of HD3D will mean that gamers can now play 3D games. "With 1,120 stream processors, the HIS HD6870 Fan Turbo supports the latest HD3D games," explains HIS. "Gamers can take advantage of the powerful DirectX 11 engine, which delivers unparalleled image quality and blindingly fast performance. "HD3D technology transmits two separate images to each of your eyes at the same time at a resolution beyond 1080p. "Supported with HD3D glasses, this technological innovation comes with Stereo 3D gaming, Blu-ray 3D, 3rd Party Stereo 3D middleware software and 6800 Series GPU support."